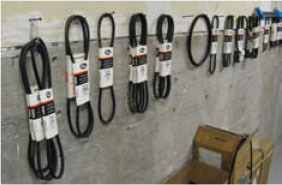 In order to retain their serviceability and dimensions, proper storage procedures must be followed for power transmission belts. Quite often, premature belt failures can be traced to improper belt storage procedures that damaged the belt before it was installed on the drive. By following a few guidelines, these types of belt failures can be avoided. Belts should be stored in a cool and dry environment with no direct sunlight. Ideally, belts should be stored at less than 85°F and with lower than 70% relative humidity. Belts should not be stored near windows, which may expose the belts to direct sunlight or moisture. Belts should not be stored near heaters, radiators, or in the direct airflow of heating devices. Belts should not be stored near any devices that generate ozone such as transformers and electric motors. Belts should not be stored where they are exposed to solvents or chemicals in the atmosphere. Do not store belts on the floor unless they are in a protective container. Floor locations are exposed to traffic that may damage the belts. Do not crimp belts during handling or while being stored. To avoid this, belts must not be bent to diameters smaller than what is recommended (minimum recommended diameter for inside bends and 1.3 times the minimum recommended diameter for back side bends). Do not use ties or tape to pull belt spans tightly together near the end of the belt. Do not hang on a small diameter pin that suspends all of the belt weight and bends the belt to a diameter smaller than the minimum recommended diameter. Improper storage will damage the tensile cord and the belt will fail prematurely. 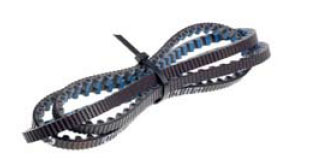 Handle belts carefully when removing from storage and moving to the application.